Lightning Labs just released an alpha version of its Lightning Network wallet. The desktop application is now compatible with Bitcoin’s mainnet and it leverages Neutrino (the protocol, not the analytics company acquired by Coinbase) to give users a lightweight option to “control their own funds,” as opposed to running a full node or trusting a third party to play custodian. The release, which Lightning Labs says in a blog post “is still an early version targeted at testers,” is immediately available for macOS, Windows and Linux, while smartphone applications for Android and iOS “are coming very soon,” Hase told us. Hase also said that the Android app is still in development internally and the iOS iteration is “available publicly in pre-alpha in TestFlight.” He added that the company needs to “polish Lightning Network Daemon/Neutrino stability and performance” before the full releases. For the desktop application, v0.5.0-alpha will launch on Bitcoin’s mainnet by default, while prior versions will now allow users to automatically update when they enter testnet (the testnet version will still be available, though it will likely be most useful for developers and engineers in light of this mainnet release). The update has introduced a slew of improvements, according to Lightning Labs. It sports a unified balance to help users keep track of how much bitcoin they have on-chain or in payment channels, with the latter demarcated by a percentage under the aggregate balance. Users will also be able to view how many satoshis are in each channel with the app’s channel page. Autopilot — a feature for the Lightning Network Daemon implementation that makes it easier to connect to nodes to set up channels — now includes a scoring system to judge which nodes would be most effective at routing payments. This autopilot mechanism is a default feature now, though the application also lets its users manage their node connections and channels manually if they wish. Down the road, Lightning Labs will integrate Lightning Loop to give users the option to top up channel balances or empty them without closing the channels themselves. The above features are notable for user experience and interface improvements, but perhaps the most salient addition in the release is the wallet’s use of Neutrino. As the blog post succinctly spells out, Neutrino, which can be used for on-chain wallets but is especially useful for Lightning, “is a light client specification that allows non-custodial Lightning wallets to verify Bitcoin transactions.” Basically, it allows software clients (applications) to receive compressed blockchain data to verify transactions without having to download the full Bitcoin blockchain, which clocks in at an unwieldy 200 GB. This gives these clients a degree of the same privacy that full nodes enjoy, without sacrificing custody of funds to a third party (the typical trade-off for using a lightweight wallet). So if you use Lightning Labs’ wallet, even if you’re not connected to your own node, you have complete custody of your funds. The post concludes by warning users that Lightning is “still very early technology and there’s a risk of losing all of your funds.” It also calls for the community to help improve the application by reaching out to Lightning Labs and opening up requests on GitHub. As the technology is still risky — and the Neutrino client is young — Lightning Labs won’t be resting on its laurels. As Hase told us in our correspondence, there’s still plenty of work to do and much they can learn from this rollout as users begin tinkering. “It’s still the very first release and now is the time to iterate and start learning,” he said. Online banking platform Cashaa is set to allow users to purchase bitcoin, ether and Cashaa’s own token, CAS, using major credit and debit cards. This new service is a follow-up to the Business Banking Services Cashaa launched earlier in April 2019, which allows both individuals and private firms to open accounts with Cashaa and accept cryptocurrency payments. According to a company statement shared with Bitcoin Magazine, the service will be available to users all over the world, excluding the U.S. Launched in 2016, Cashaa’s stated mission is to use the advantages of cryptocurrency to “bank the unbanked,” allowing a greater array of possible users better access to a financial system. To this end, Cashaa caters to a variety of nations and currencies, including global currencies like the Philippine peso, Indian rupee, Singapore dollar and Swedish krona, as well as Euros and the pound sterling. “This functionality was constantly being asked by our existing personal users from more than 109 countries,” said Kumar Gaurav, Cashaa’s CEO, per the statement. Using credit and debit cards to purchase crypto assets through Cashaa will allow users to spend anywhere from a half to a third as much in transaction fees compared to industry average prices, the company claimed. Additionally, Cashaa’s service fees for these transactions can be cut further by paying them via CAS tokens. Japan’s Financial Services Agency (FSA) is looking into two major cryptocurrency exchange platforms as part of an investigation. According to a report published by Reuters Japan on April 23, 2019, the investigation by the financial watchdog is connected to the legal compliance and customer protection standards of trading platforms Fisco Digital Asset Group (FDAG) and Huobi Japan, the Japanese subsidiary of Huobi Global. FDAG recently acquired the crypto exchange Zaif, which was hacked last year, from Tech Bureau for $44.7 million. Huobi Global, meanwhile, expanded into Japan through the acquisition of the regulated exchange BitTrade. Earlier this year, Huobi Korea, the South Korean subsidiary of Huobi Global, announced that it would be strengthening its anti-money laundering protection standards. The firm’s focus was on its fiat-to-crypto oversight measures, as well as the processes for withdrawals and deposits on its platforms. It resolved that it will keep close tabs on all transactions that it deems suspicious. In addition, the exchange highlighted its commitment to provide periodic updates to its fraud-detection algorithms. Bitcoin clearly broke upward out of reaccumulation trading that had spent three weeks consolidating sideways. The market has begun to drift into a zone of supply between the $5,700 and $6,000 levels. There are a lot of underwater positions that are looking to break even, so it seems likely that we will start to encounter sellers looking to get out of the market. The daily Bollinger Bands consolidated tightly and have begun to expand — indicating that a macro bullish continuation is likely. Trading and investing in digital assets like bitcoin is highly speculative and comes with many risks. This analysis is for informational purposes and should not be considered investment advice. Statements and financial information on Bitcoin Magazine and BTC Inc sites do not necessarily reflect the opinion of BTC Inc and should not be construed as an endorsement or recommendation to buy, sell or hold. Past performance is not necessarily indicative of future results. Online investment service TD Ameritrade might be giving its users simulated exposure to bitcoin and litecoin through a new, but not-yet-live, offering on NASDAQ. According to reports on social media, the brokerage platform is offering paper trades for bitcoin and litecoin through NASDAQ. Paper trading is a simulated form of trading that lets users exchange an asset without actually buying or selling it for real money (think of it like a testnet of sorts). In a tweet labeled “BREAKING,” the quantitative analyst “Cryptopolis” first sounded the horn on April 22, 2019, hastily claiming that “BTC is now being traded on the NASDAQ!” The Twitter user would later qualify in an updated tweet that the offering, demarcated by the symbol CXERX, is actually a paper trade holding no real value. “That’s not a symbol we trade on the live side so Im [sic] not really able to speak on it,” a TD Ameritrade support staff told Cryptopolis, per the updated tweet. “The only bitcoin related products that we trades [sic] are Bitcoin Futures under /XBT,” the support staff continued, saying that their best “guess” would be that the trading is testing. “It’s paper trading, so they are just testing right now, but it’s there for sure,” he added in the comments. When Bitcoin Magazine reached out to TD Ameritrade to ask if the information was valid, a spokesperson neither confirmed nor denied the paper trading. At the time of publication, we had not heard back on a follow-up asking specifically if paper trades were available. It should be noted that, while the testing is available on TD Ameritrade, the exchange offering the paper trading is NASDAQ, from which TD Ameritrade pulls some of its offerings. Bitcoin Magazine reached out to NASDAQ to confirm the news as well, though we did not hear back at the time of publication. If the legacy exchange is indeed offering paper trades for bitcoin and litecoin, the development would be in line with its recent moves to advance itself in the cryptocurrency industry. NASDAQ announced last year that it is eyeing bitcoin futures and it also partnered with investment management company VanEck to launch bitcoin and ether indices this year. The recent bitcoin rally has driven bitcoin mining profits. Profits earned from bitcoin mining have seen a clear rise since the start of April 2019 and hit a near half-a-year high on April 15, 2019. According to crypto analyst Alex Kruger, the breakeven cost for efficient bitcoin mining operations currently hovers around $3,550 to $4,350, while the price of bitcoin is in the $5,500-plus range at the time of this writing. That ensures a $1,000-plus profit for each bitcoin mined and a substantial profit for bitcoin miners considering the uptick momentum in bitcoin price continues. Kruger said that the breakeven cost was calculated based on an electricity rate of 5.5 cents per kilowatt hour (kWh). While electricity costs vary in different regions, the breakeven cost could vary in line with that. Given that the electricity rate in China is much lower — 3.5 cents kWh as some mining farms have claimed — when the wet season in Sichuan started, miners in China can make more than $2,000 in profit for each bitcoin mined. Over the second half of 2018, however, the breakeven cost dropped below the BTC price, leading to inefficient bitcoin mining and losses, with some miners even shutting down their operations and selling off their hardware. Together with the rise of mining profitability, the hashrate of the whole Bitcoin network has also been climbing. That means more miners have been coming back or freshly entering the market. As BTC.com shows, Bitcoin hash power has seen a 25 percent increase, from 36.55 Exa hashes per second (Eh/s) in mid-December 2018, to 45.76 Eh/s in mid-April 2018. The ASIC miner market has also been waking up, rolling out faster, new-gen mining devices. In late March, Canaan rolled out its Avalonminer 10 which delivers a hashrate of 31 terahashes per second (TH/s) at 1,736 watts (W). Days later, Bitmain revealed its Antminer 17 series, delivering a hashrate ranging from 50 TH/s to 56 TH/s, operating at 42 watts per terahash (W/Th) to 45 W/Th. And MicroBT released a whopping 72 TH/s bitcoin ASIC M20S recently. These figures suggest that the market is showing signs of life after coming off of some of its worst months. Bitcoin mining is finally profitable for miners and getting its prospects back after the year-long sluggish market. Andrei Poliakov is the CEO and co-founder of Coinberry, one of Canada’s premier digital currency platforms. His company is the first in Canada to partner with a government municipality. I am an engineer by trade. Creating more efficient processes, products and eventually building businesses has been a passion of mine since I can remember. When I got involved with blockchain technology, I realized right away the potential benefits the application of this new technology could have on the financial industry. But this was several years ago, when people would think you were a little crazy if you brought up Bitcoin at an event or a party. So I got down to building a business, a team and tech that would bring about mass adoption of blockchain technology and, more specifically, the application of blockchain technology to finances in the form of cryptocurrencies. And finally, it’s happening all around you. Right now, at this very moment. Most people miss it, but what we’re seeing in early 2019 is the birth of cryptocurrency mass adoption and it’s affecting governments in a positive way. While a lot of people are asking themselves, “Is this really the next bull run?” or “Are we really going to see Facebook or ‘XYZ’ social network launch a cryptocurrency?” governments are starting to implement technology to facilitate cryptocurrency transactions today. Real change is happening, at a governmental level, that will pave the way towards mass adoption. In early March 2019, Coinberry provided the technology, infrastructure and implementation for the town of Innisfil, a government municipality in Canada, to start accepting tax payments in bitcoin. This was a huge win for the industry. While the municipality is small, the innovation from the government and the willingness for a government agency to accept cryptocurrency is a giant leap forward. It is the first government partnership of its kind in Canada. While this partnership is just a start, it is one of the first changes that will unleash additional government adoption moving forward. Other government municipalities have started asking us about the implementation, wanting to know more about how, why and what it would take to offer similar services to their residents. Why are they now, all of a sudden, so interested in blockchain technology? What does this mean for governments moving forward? To get a clear picture of what’s coming, we’ve got to look at the underlying motivation of municipalities from a government funding perspective. Regardless of where you stand on the issue of government spending, all governments need money to pay for things like roads, schools, police, fire, hospitals and the like. At present, most governments have very limited options when it comes to making this happen. They can raise money by increasing taxes, issuing bonds or by printing more money. The latter option is only available to federal governments. One additional option, that was not fully available until cryptocurrency arrived, is to cut transaction costs by using more efficient financial technology. This last solution is the low-hanging fruit that governments, like Innisfil’s, are focused on and is a trend that is poised to spread quickly through small and large municipalities alike. Governments are starting to realize that cryptocurrency provides a safe, easy way to reduce transaction costs. This is not a hypothetical scenario anymore: This is a reality. With relatively little effort, a municipality can have more funds without increasing taxes, issuing a bond or implementing budget cuts. This idea has led to an increase in the number of municipalities that are interested in cryptocurrency, both as a form of tax payment and, eventually, as a means to facilitate government transactions: think payroll, contractors and municipal investments. Take bank fees as an example. Our involvement with Innisfil began when the municipality approached us with a challenge. It was paying in the neighborhood of $5 million annually in bank fees when it came to processing payments and it wanted to reduce this cost. Saving a percentage of transaction fees — in this case on an annual basis — could result in hundreds of thousands or even millions of dollars saved. Imagine a 5 percent savings in transaction costs on the $5 million paid in fees annually. That’s $2.5 million in transaction costs saved over 10 years. While this isn’t necessarily a large number in and of itself, I wouldn’t dismiss it, especially when those savings can be obtained with minimal cost and effort. Reducing transactions costs on tax payments alone, simply by utilizing a more efficient technology, frees up money that the government is able to regain without having to affect you, the citizen. More governments will realize this and look to implement similar technology in their own regions. Which brings us to the next trend. Take the tax example above. Let’s say that “Municipality A” collects $500 million in tax revenue. To put this in perspective, Toronto — one of the largest cities in the world — collects over $11 billion dollars per year on average through various revenue streams. At the moment, if a municipality starts collecting 10 percent of the above $500 million in revenue in cryptocurrency — or $50 million in this case — it would need to immediately convert that to fiat currency. Why? Because some cryptocurrencies are securities and while the law varies depending on the region, most municipalities are not allowed to invest in securities at the moment and have very limited options when it comes to assets that they are allowed to invest in. As such, the $50 million in cryptocurrency would need to be immediately converted to fiat currency. That 10 percent discount could amount to an additional $1 million in the government’s coffers. Perhaps it could put that toward building that recreation center it’s been promising to build every time elections comes around. Or what happens when municipal employees start asking for payment in cryptocurrency? Or governments realize that they can save transaction costs in other areas of operations? As governments start to accumulate cryptocurrency via tax revenue, expect to see a slow build in pressure to shift municipal law toward allowing municipalities to hold and transact in cryptocurrency. The third trend that we’re going to start seeing relates to raising money through bonds. If you’re a government and you need to raise money for a new street, for a new community center, to fix potholes or to pay for the police and fire department, you essentially have three primary ways to raise the necessary capital. Only two are applicable at the municipal level. Option 1: You can reshape the allocation of current tax revenue (budget cuts) or increase taxes on property, business or individuals. Option 2: You can print more money, driving inflation, lowering purchasing power and affecting economic growth. This is only an option at the federal level and does not apply to municipalities. Option 3: You can sell bonds — promissory notes that allow companies and individuals to invest in your government. Government bonds typically come with both a very low rate of return but also come with a very low default risk. While other, smaller options may be available, we’ll stick to these primary methods for now. It’s no secret that all governments need money. Everyone is running on deficit, using money allocations from federal, state or provincial governments. Raising capital through bond issuance via cryptocurrency is going to be the next immediate trend that governments start to leverage. Cryptocurrency bond issuance can reduce transaction costs on the issuance itself — saving hundreds of thousands, or millions, of dollars in the process. Governments will be able to tap into much larger markets, opening up to easier and cheaper foreign investments. Governments will be able to provide liquidity for their bond offerings, encouraging investors to invest into their bonds. With government bond tokenization, many benefits start to unfold that allow for a more efficient marketplace. In the very near future, within 12 months or so, I would expect to see government bond issuance via cryptocurrency. No one is going to deny that blockchains and cryptocurrencies are difficult concepts to grasp. They’re quite complex in general, and the technology and development are conducted by experts in the field. But just as you don’t need to understand how H.264 encoding works to watch the latest high-definition movie trailer on YouTube, understanding the intricacies of blockchain technologies is not necessary for leveraging the applications that run on them. Ultimately, it all comes down to ease of use. In summary, expect to see more governments adopting blockchain technology to reduce costs, municipal laws to shift favorably toward cryptocurrencies and for governments to start looking at raising capital on blockchains. We’re already seeing larger municipalities like Richmond Hill explore the possibility of using cryptocurrency for tax remittance as well. It’s happening all around you. Right now, at this very moment. The wave is rising and the birth of mass adoption is happening. This is a guest post by Andrei Poliakov, CEO and co-founder of Coinberry. Opinions expressed are entirely his own and do not necessarily reflect those of BTC Inc or Bitcoin Magazine. Joel Ortiz, the 21-year-old student who was accused of stealing over $7.5 million in digital assets via a SIM swapping operation, has been sentenced to 10 years in prison. He had pleaded guilty in February and accepted the plea bargain. According to the official documents released on April 22, 2019, Ortiz was accused by the Santa Clara County’ District Attorney’s Office of hacking over 40 cellphones. The attorney’s office labeled him a “prolific SIM swapper,” noting that in one of his operations, he succeeded in stealing over $5.2 million of his total loot within a matter of minutes from a California-based crypto entrepreneur. Ortiz was arrested last year at the Los Angeles International Airport; earlier this year, he pleaded no contest (not pleading guilty, but accepting the charges) to 10 separate charges of felony theft. The document also pointed out that the funds were used primarily to bankroll a lavish lifestyle; he spent $10,000 at various Los Angeles clubs, hired a helicopter for a music festival, and spent even more on branded clothes and luggage. If you’re a creditor in Mt. Gox’s civil rehabilitation case, the defunct exchange may have automatically filed and approved a reimbursement claim for you — provided that your Mt. Gox account was verified when it was still operating. According to a Reddit post from user DerEwige on April 22, 2019, Nobuaki Kobayashi, a Japanese attorney and trustee of the ongoing case, has alerted former Mt. Gox users who didn’t voluntarily apply for reimbursement that they will also receive compensation for their lost bitcoin as rehabilitation takes effect. The exchange is using KYC information that was originally submitted to verify accounts to register users who haven’t directly applied for rehabilitation. Handling more than half of all bitcoin transactions at the time of its closure, the Japanese exchange suspended trades and declared bankruptcy in 2014 following an alleged hack. Since then, legal battles have been ongoing in Tokyo courts. In June 2018, legal proceedings shifted from bankruptcy to civil rehabilitation following the court’s approval of a creditors’ petition that was filed in November 2017. The legal move provided more leeway for how creditors could be reimbursed. Two months after the shift, private individuals were allowed to begin filing claims for reimbursement and this same filing system was opened up to corporate clients that September. 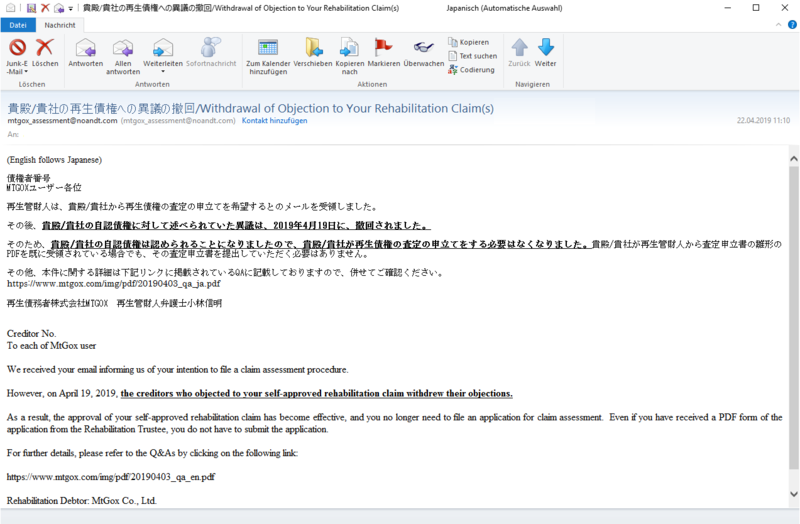 The email also included an English translation of some of the court’s most frequently asked questions regarding the civil rehabilitation process. As section Q1-5 states, the process will now generate “self-approved claims,” wherein users will be notified that they are eligible for reimbursement even if they did not file a claim personally. DerEwige claimed that he fell into this category, as his sum of bitcoin stored in Mt. Gox was so small that he did not consider an arduous claims process to be worth the effort. It is unclear how difficult it will be for non-KYC clients to pursue civil rehabilitation, just as it is unclear what form of reimbursement this will take and on what timetable it will be carried out. The FAQ added that “the submission deadline for a rehabilitation plan is April 26, 2019, but it may be extended depending on the progress of the proceedings,” claiming that users “will be informed through the appropriate channels, including this website, when a rehabilitation plan is submitted.” Besides this deadline to make a plan, no concrete objectives in the roadmap have been made public knowledge yet. Crypto payment startup Moon has announced an online web browser extension that allows crypto users to make purchases on e-commerce sites like Amazon.com with Lightning Network payments, CoinDesk reported. Once the extension has been added to a user’s browser, they will be prompted to register and integrate it with a Lightning-enabled wallet. It should be pointed out that Amazon itself doesn’t accept bitcoin. Rather, the process begins with the user paying with crypto assets followed by a payment processor converting the assets into fiat currency and settling with the merchant. At checkout, the Moon extension provides a typical QR code with the invoice for payments. Once payment is completed, the user should be redirected to Amazon’s Success Page. Moon is available in the Chrome Web Store but its Lightning Network feature is under review.